A spin-off of the traditional samosa alu mutar (potato and peas), these labour of love samosas, will have you coming back for more. Unlike the usual doughy samosas, these are wrapped in a paper-thin spring roll pastry which creates a much lighter samosa that uses less oil. 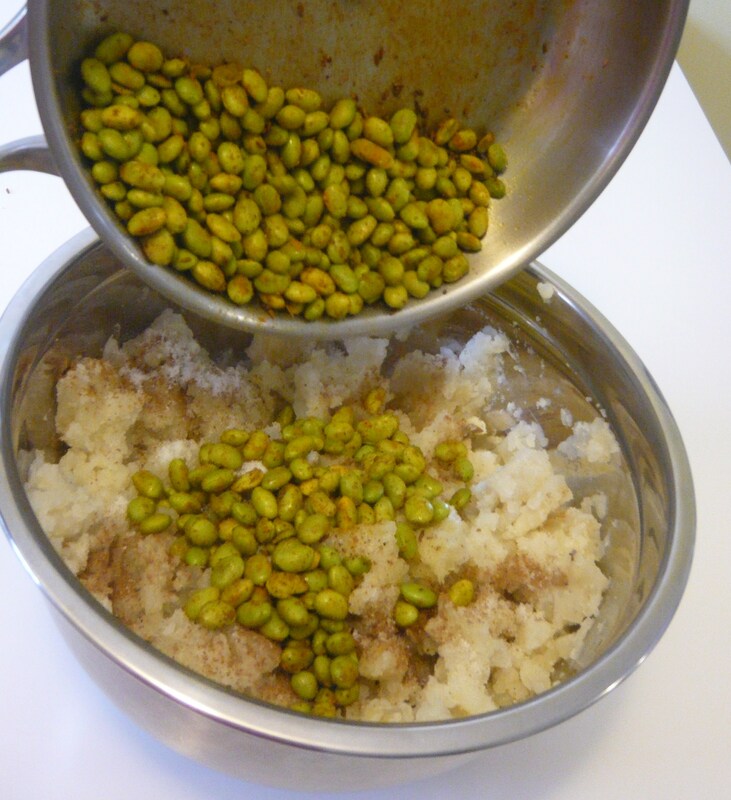 To spread out the work load, the filling and chutney can be made a day in advance. 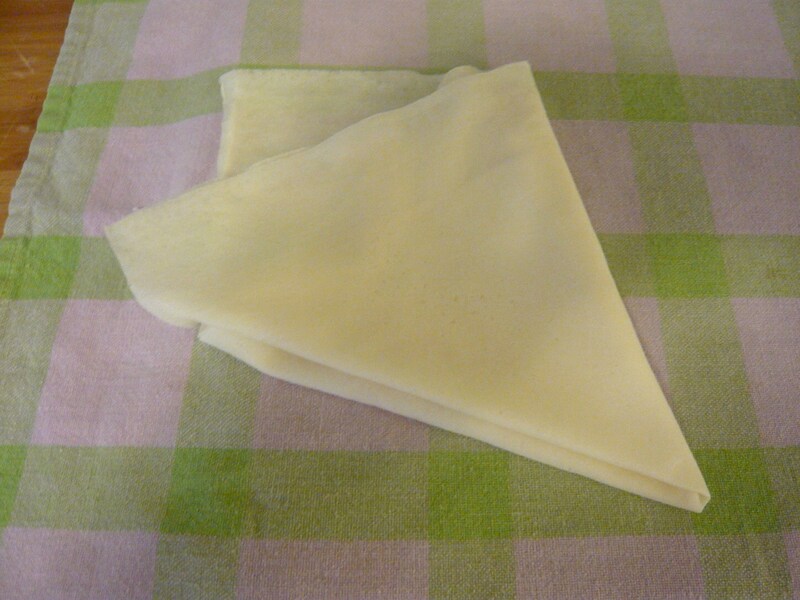 Try using the smaller sized pastry to make hors d’oeuvre sized samosa for your next dinner party. 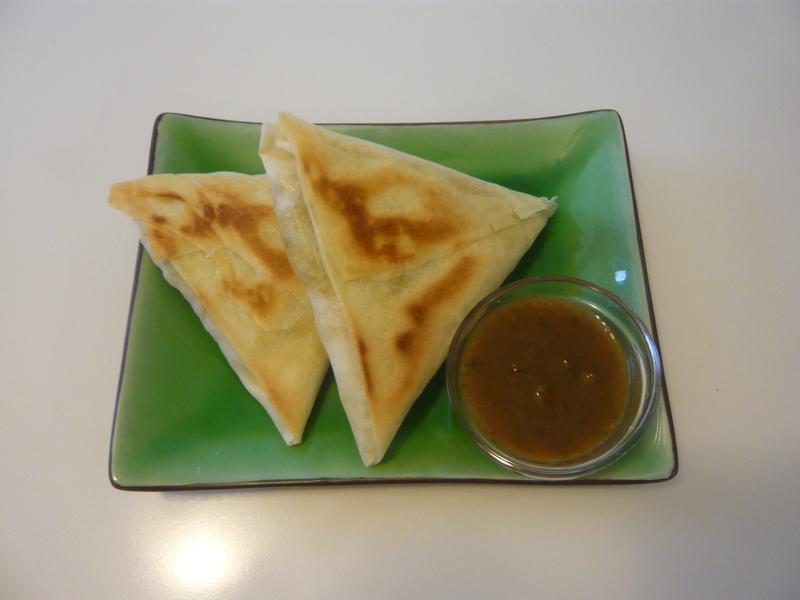 Make the filling and chutney in advance and serve freshly cooked hot samosas to your guests. 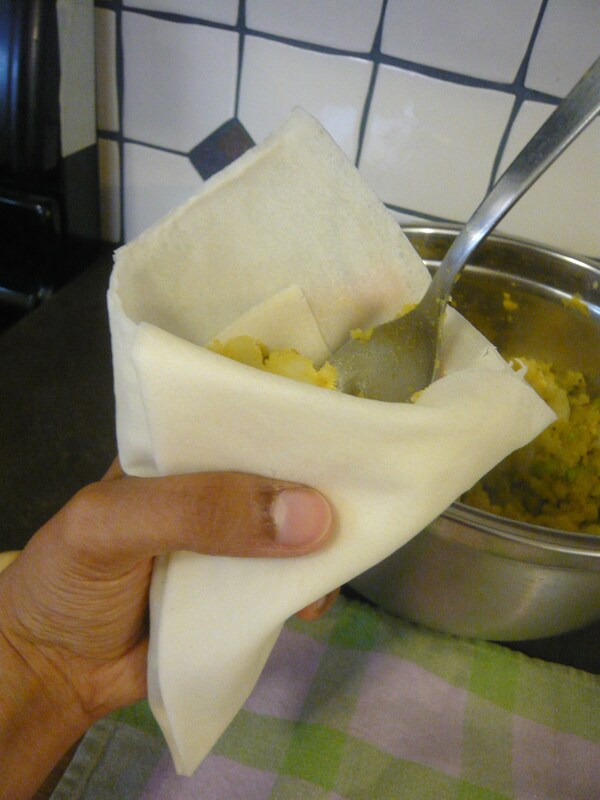 These samosas can easily be frozen and reheated in the oven, that is if they last. 1. 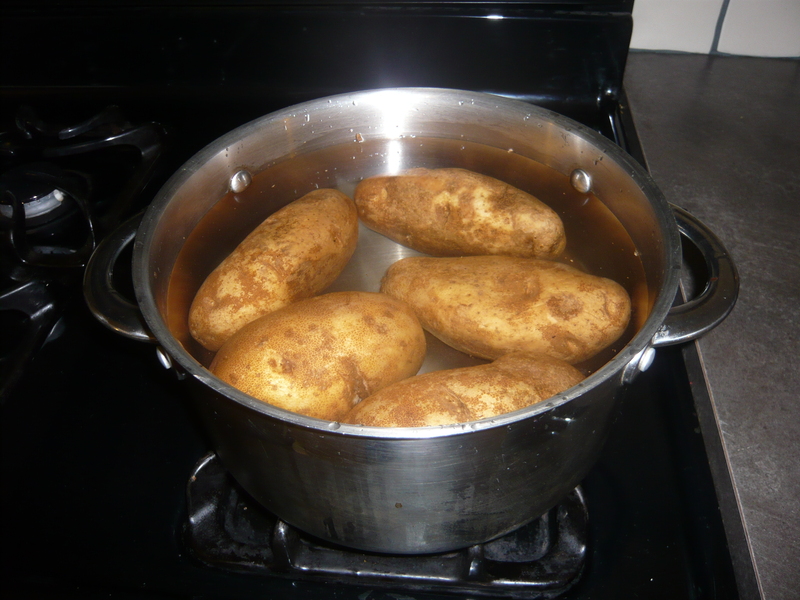 Wash the potatoes and bring to a boil in a large stock pot. Cook until the potatoes are soft and ready to mash, about 25 minutes. Strain potatoes and cool for 10 mins. 2. In a medium saucepan on medium heat add 1 tbsp of olive oil. 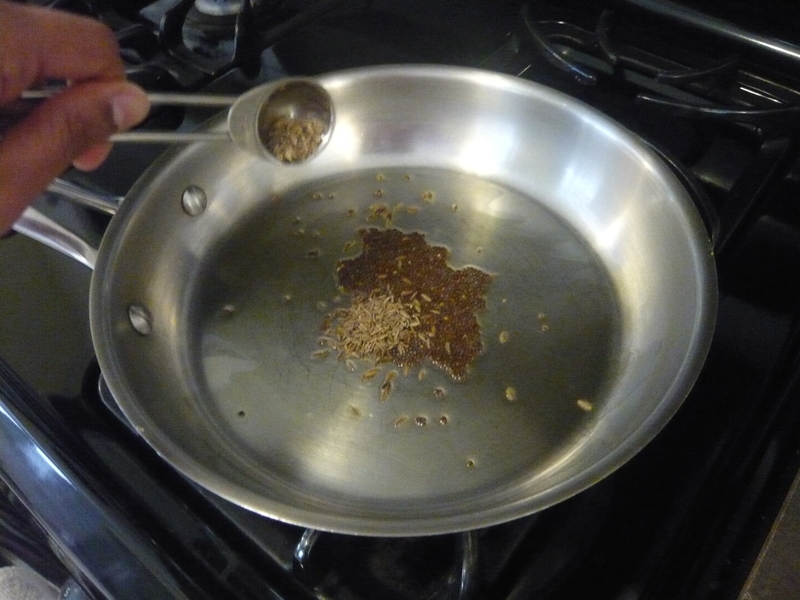 When the oil is hot add cumin and black mustard seeds. 3. When the seeds pop, add the edamame. 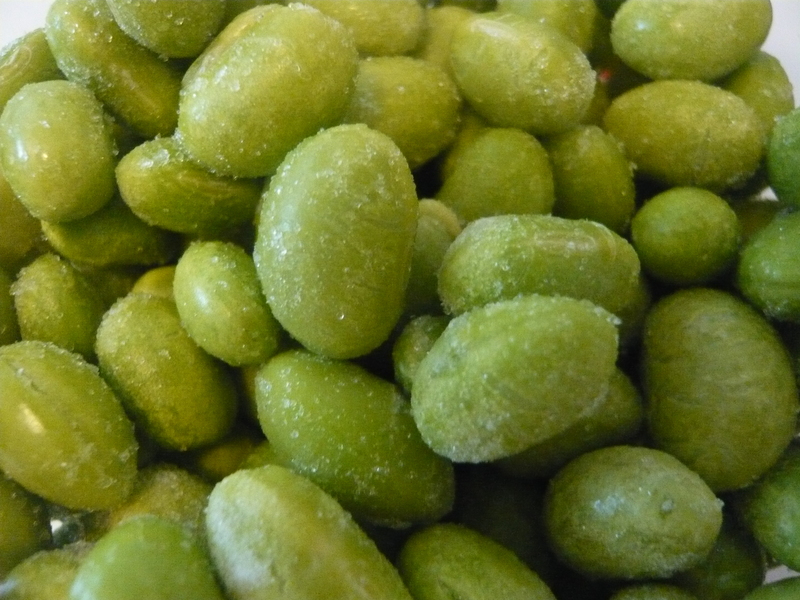 Cook until the edamame is soft, about 5-7 minutes. 4. Add the 1/4 tsp masala and 1/4 turmeric. Turn off heat and set aside. 5. 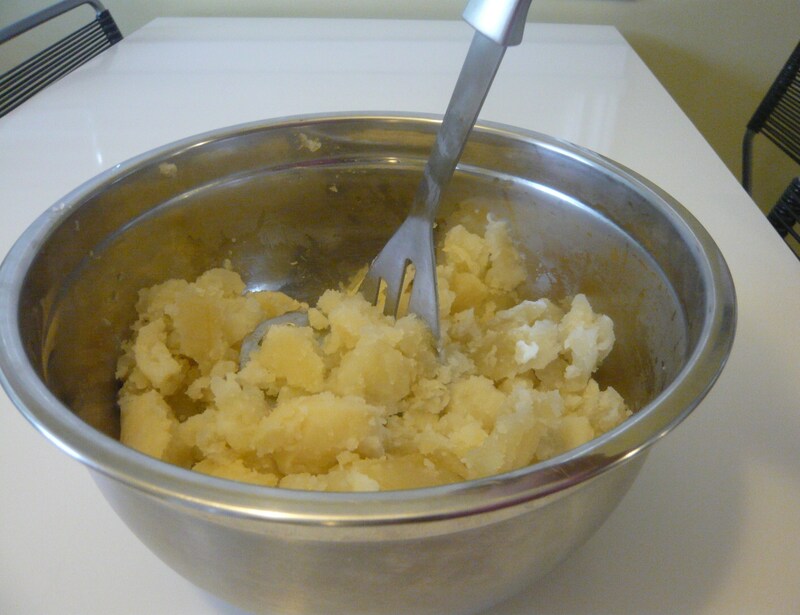 Peel and mash potatoes in a medium size bowl. 6. Add 2 tsp masala and 1 2/3 tbsp sea salt and mix together. 7. Add edamame to potato mixture and mix together. 8. 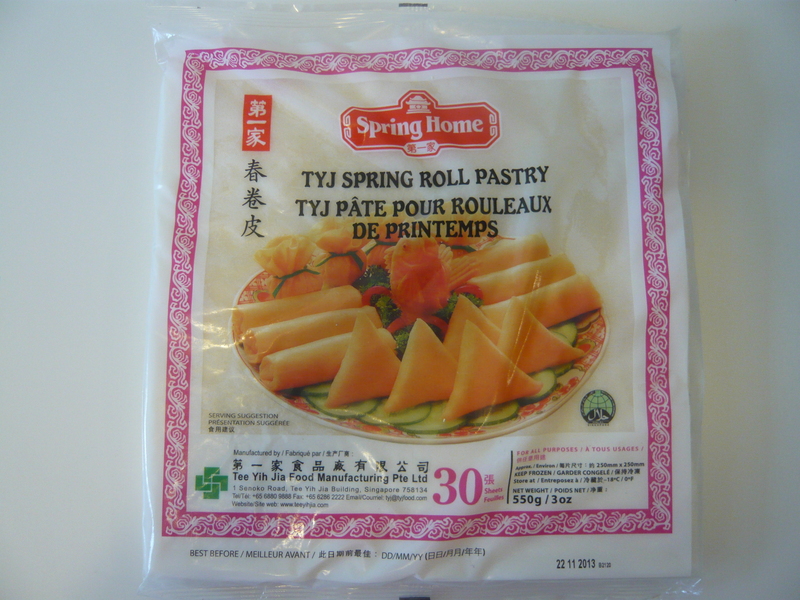 Take out the spring roll pastry from the freezer to defrost, 30 mins before use. 9. 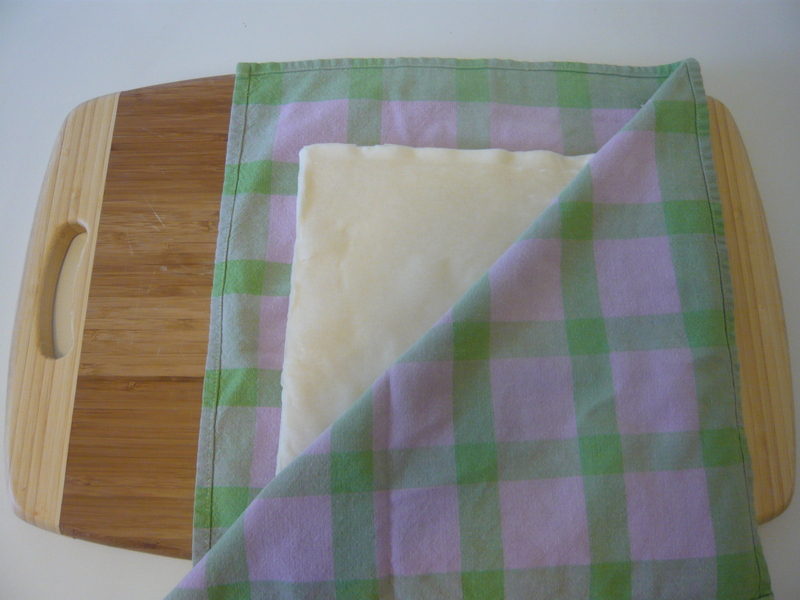 Take the pastry out of the package and place between a tea towel on a flat surface. This will prevent the pastry from drying out. 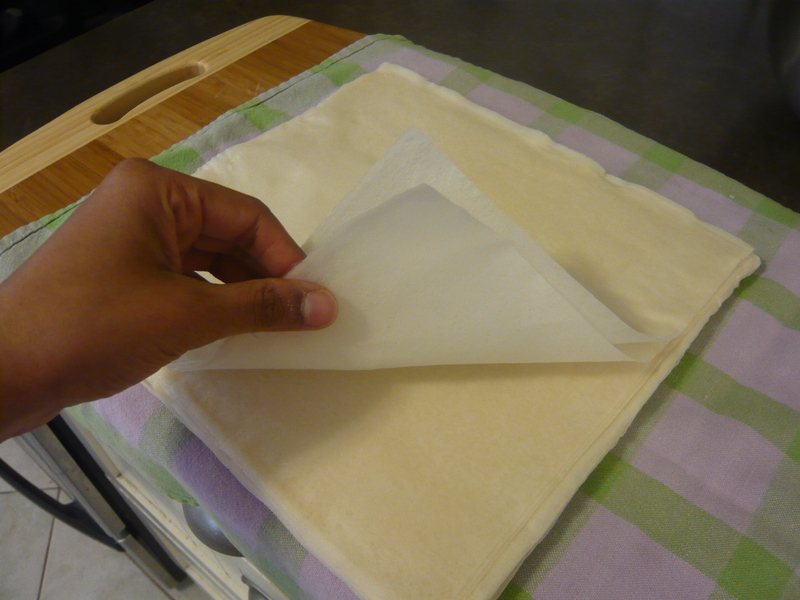 10.a Gently pull 2 sheets while being careful not to tear the pastry. 10.b Fold up the pastry leaving a 1.5 inch space at the top as shown. 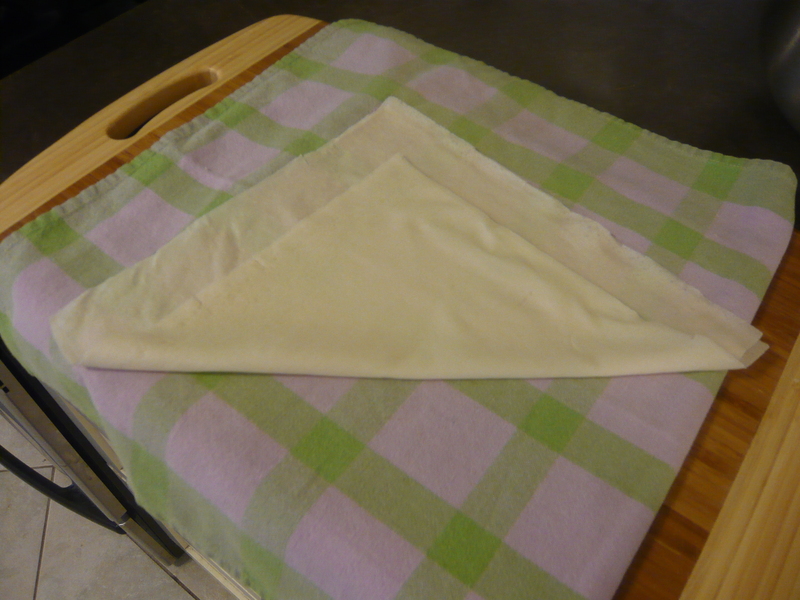 10.c Fold the left corner to the right so it touches the middle of the top edge of the pastry. 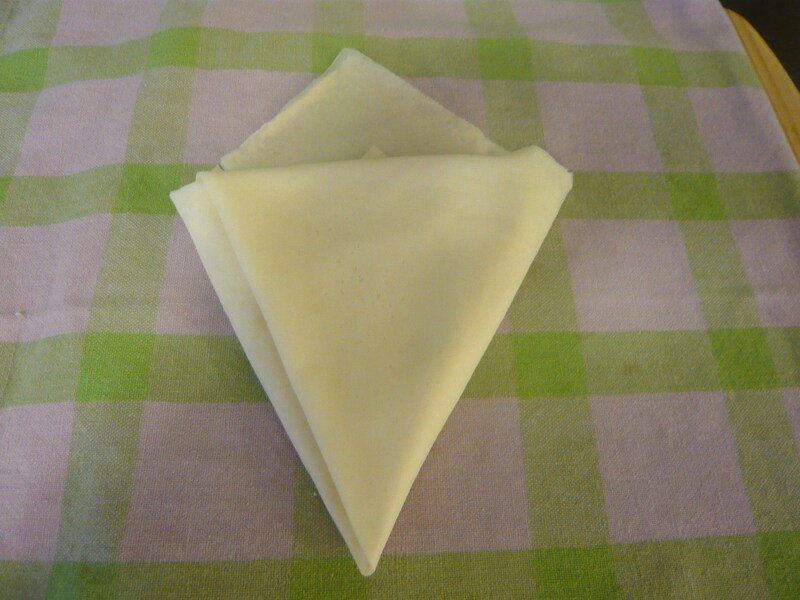 10.d Fold over the right corner to the left and make a point at the bottom. 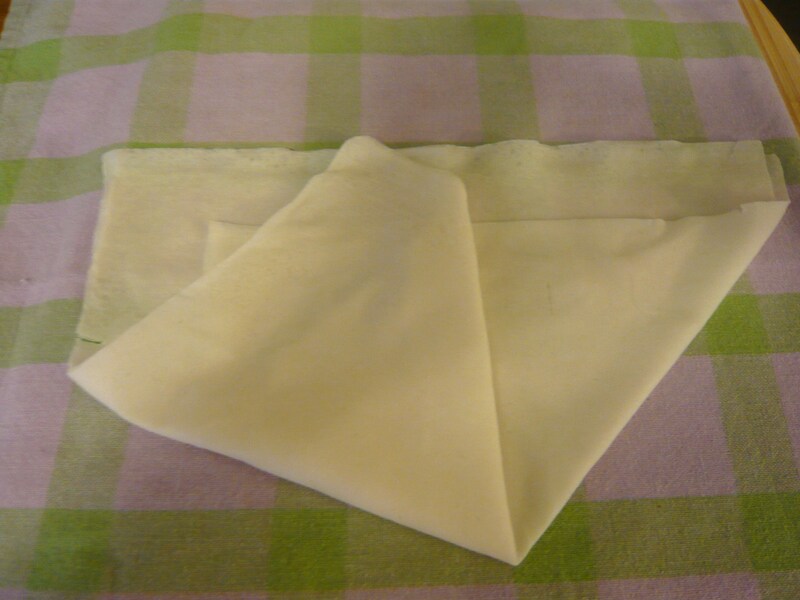 10.e Neatly tuck under the excess pastry at the top. 11.a Pick up the pastry cone. 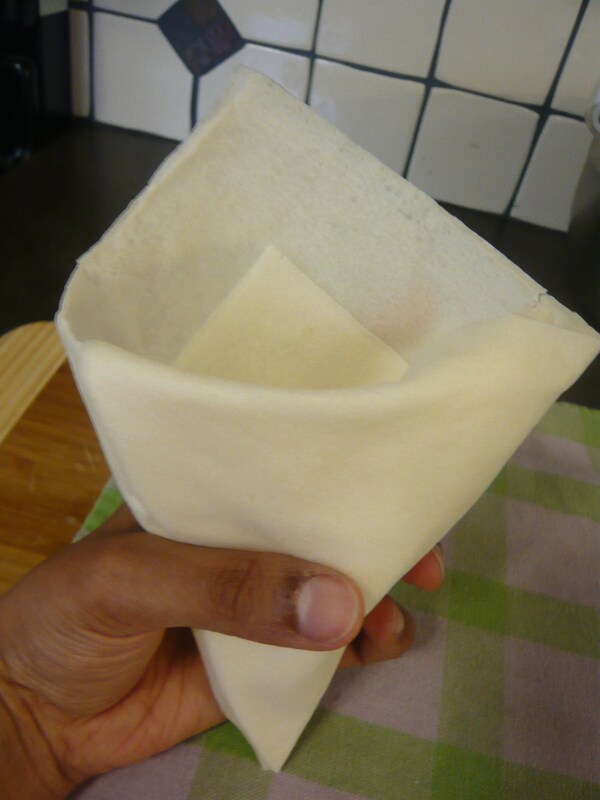 11.b Carefully fill the cone with 2 heaping tablespoons of filling. 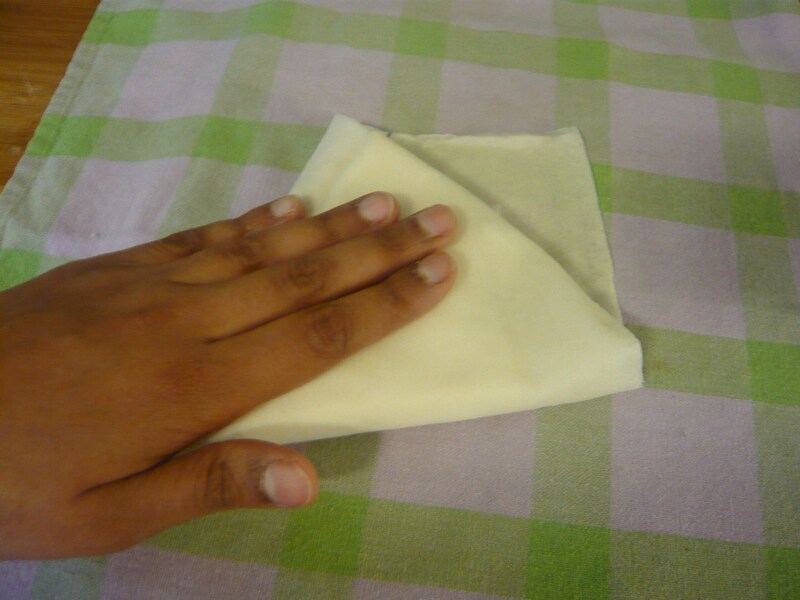 11.c Gently flatten the samosa. This makes it easier to fry and uses less oil. 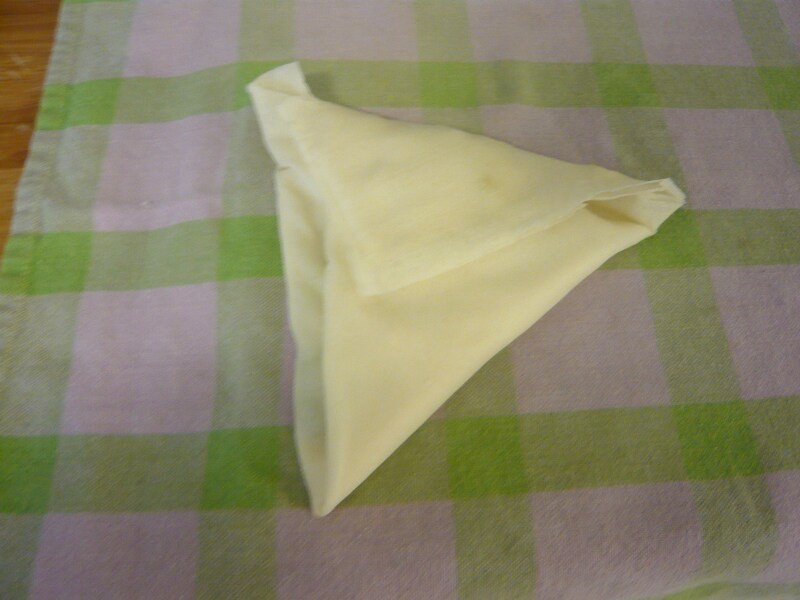 11.d Pull the top piece of pastry over to close the samosa. 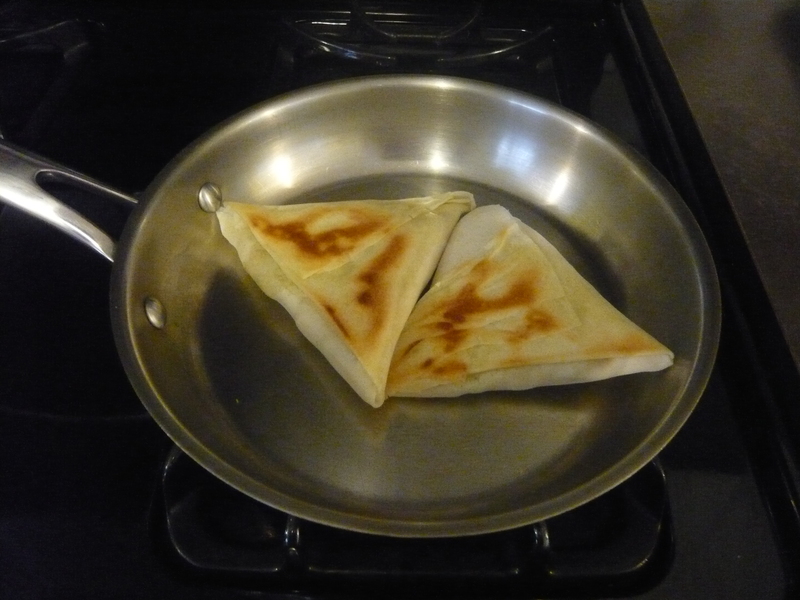 11.e Place the ready to cook samosas on a baking tray. 12. In a medium frying pan heat 1 tbsp of oil. When the oil is hot add samosas. 13. 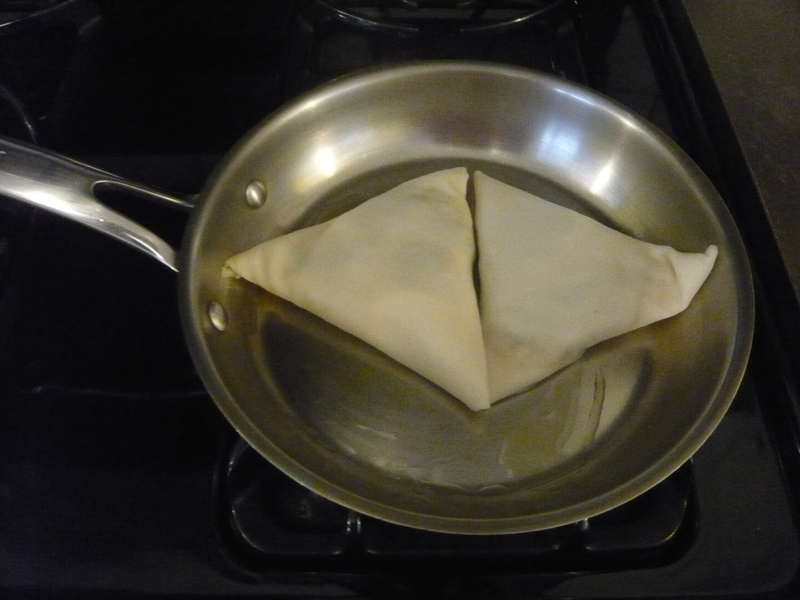 When the samosas are golden brown, turn over and cook the other side. 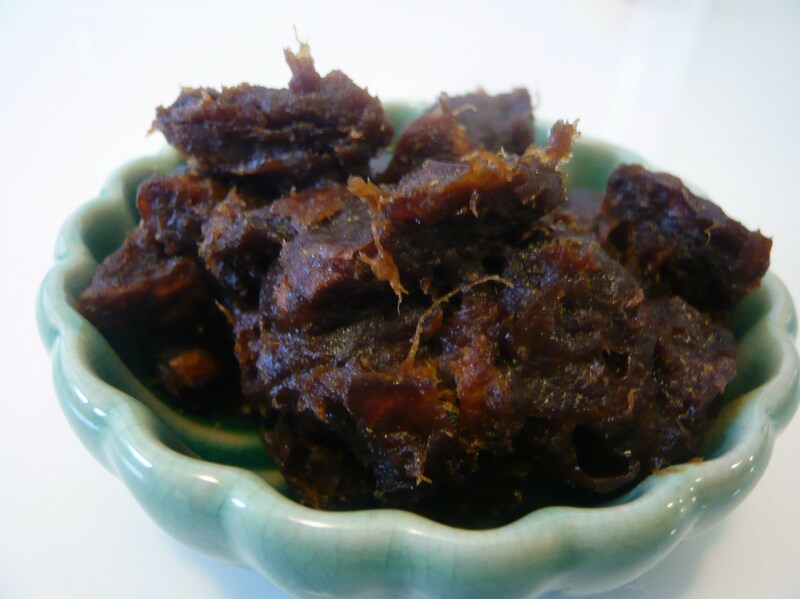 I usually use the tamarind blocks as the consistency works better for chutney than the tamarind paste in a bottle. Tamarind is sold in specialty ethnic stores and asian markets. 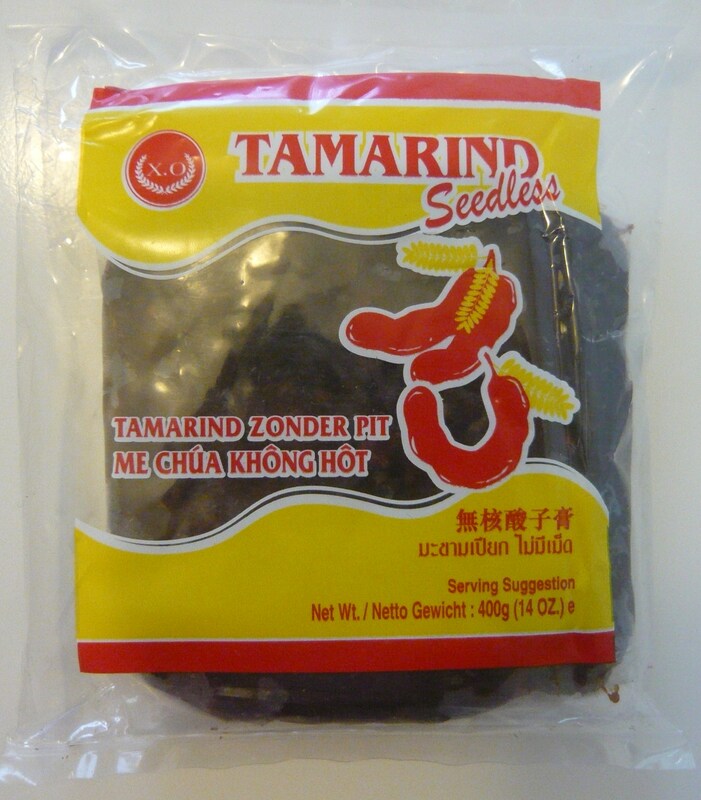 The tamarind available in Vancouver is usually from Thailand. The tamarind blocks usually contain seeds and a fibrous pod around the seeds. After soaking tamarind, be sure to carefully check for hidden seeds even if its a seedless brands as they will end up in your blender. 14. Soak tamarind in boiling water for 1o minutes to soften the tamarind. With your hands, pick out the seeds and any fibrous pods. 15. Combine tamarind, water, sugar, ground cumin, salt, cilantro and chili sauce in a blender. 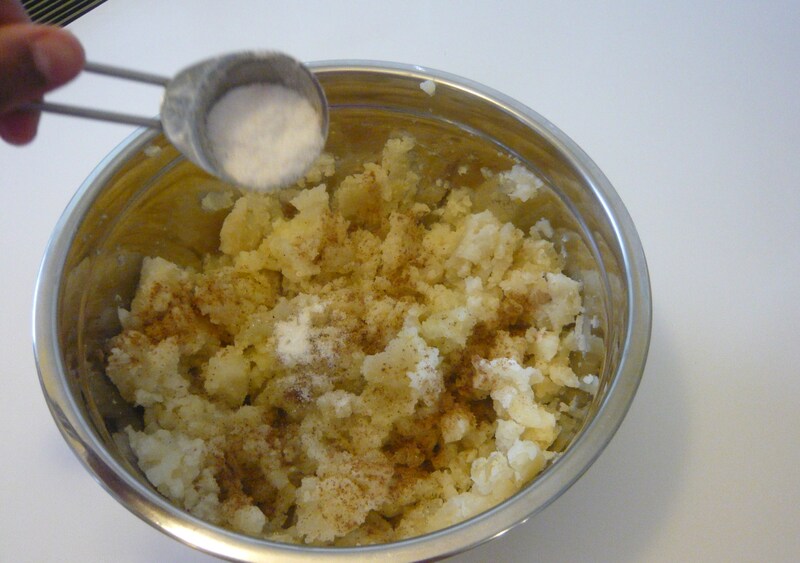 Blend until all the ingredients are incorporated and the mixture is smooth. Chill chutney before serving. You are currently reading Edamame and Masala Potato Samosas with Tangy Tamarind Chutney at Coriander Kitchen.